When we left Murten, Switzerland we drove to the the Bernese Oberland in the alpine heart of Switzerland. View from the car on the way to Lauterbrunnen. On the way to Lauderbrunnen we stopped at Wilderswil to check a map. When we opened the windows, Catherine and I heard the bells on the cows. Catherine said "We are in Switzerland". This is taken in Lauterbrunnen, Switzerland where we stayed. It is near the Interlaken area and nestled between two large mountain areas. On one side is the Eiger / Monch /Jungfrau and the other is the Schilthorn, which we explored during our stay. At the southern end of Lauterbrunnen is the Staubbach falls. The falls are about 980 feet long, the highest in Switzerland. This is taken from the parking lot of our hotel, the Hotel Staubbach. 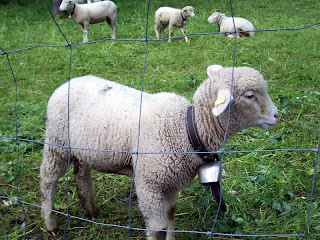 A lamb in a field near the hotel in lauterbrunnen. We caught a gondola (cable car) heading to Murren and the mountain Schilthorn. The first stop on the gondola is Gimmelwald. Then on to the alpine town of Murren. Glad to see your new posts. Murten is beautiful and these Alps' photos are great, but it's true that the beauty of the Interlaken region helps a lot. I've some photos from different visits but the bulk is from a 1986 trip through the Alps that I'll post one of these days at the Blogtrotter 80's. When were your pictures taken?